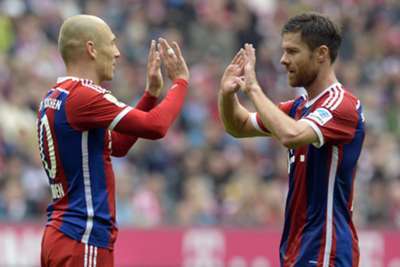 Bayern Munich’s top-of-the-table clash at Borussia Monchengladbach could not come at a better time for the Bavarian giants. The defending Bundesliga champions are four points clear at the top and can extend that gap to seven with an away win and if other results go their way. Pep Guardiola’s men have won their last six matches in all competitions, scoring 24 goals in the process – a run highlighted by a stunning 7-1 UEFA Champions League success at Roma on Tuesday. Arjen Robben scored twice in the victory and felt the nature of the win was a glowing reflection of his side’s quality. “I’m still convinced Roma have a very good team – they’ve shown that this season,” Robben said afterwards. “But we should pay a big compliment to us, to all the players, but also to the coaching staff who prepared this game in the way we played, the way we created chances and scored goals. Second-placed Monchengladbach have not been beaten in the league this season and won 3-0 at Hannover last time out. Werder Bremen’s bid for their first Bundesliga win this term continues when they host Cologne on Friday. Werder sit bottom of the Bundesliga with just four points from eight matches and they have conceded 22 league goals this campaign. Robin Dutt’s side have flirted with relegation in recent times, finishing in the bottom half of the table in three of their last four seasons. That is a far cry from the club’s efforts between 2003-04 and 2009-10, in which Werder finished in the top three on six of seven occasions, a run that included their 2004 league triumph. Theodor Gebre Selassie, Philipp Bargfrede and Santiago Garcia have all recently returned to training for Werder and could come into contention. And Werder, thrashed 6-0 at Bayern last weekend, will at least take confidence from their excellent home record against Cologne, which has seen them win nine of the last 10 matches in Bremen – the visitors last succeeding in December 1995. Also without a win are Freiburg, who with five draws in eight matches will be out to exit the relegation zone with victory at Augsburg. Borussia Dortmund eased to a 4-0 win at Galatasaray on Wednesday, but their continental form – which has seen them win all three of their group matches – is in stark contrast to their Bundesliga struggles. Dortmund have slipped to 14th, just one point above the relegation zone, after losing five of their first eight matches – making Saturday’s home clash against Hannover crucial. Bayer Leverkusen will hope to end a run of three straight league draws at home to Schalke, with both sides sure to be buoyed after mid-week UEFA Champions League wins. Mainz and Hoffenheim remain undefeated and face off against Wolfsburg and Paderborn respectively. Elsewhere, Hertha Berlin and Hamburg will hope to breathe life into stuttering seasons in the German capital, while Eintracht Frankfurt take on Stuttgart.